Every Customer Support department, Service Desk or IT Help Desk providing assistance to technology users necessarily faces a common challenge: how to make the most effective use of expensive human resources and increase the speed of problem resolution. 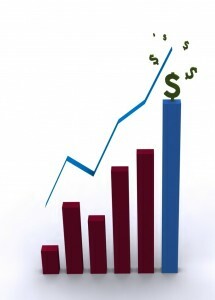 The core factors are time and money. The greater the demand for service, and/or the longer the average call or other interaction takes, the more staff will be required in order to ensure a satisfactory level of center responsiveness. The skills and knowledge resources required of support representatives are very costly to build and to maintain. At the same time, the “human touch” is vital to ensuring continuing customer satisfaction and loyalty, and every support interaction is an opportunity to strengthen the profitability relationship. The key to success in Customer Support/Service, therefore, is to eliminate all unnecessary interactions and to tightly focus the desirable conversations that do occur on what will ensure maximum customer retention and company profitability. One of the greatest challenges in customer/technical support has always been the difficulty and inefficiencies in talking users through the diagnostic and resolution phases of a case. The critical aspect is the dependence on language; the requirement for accurate communication and understanding at both ends of the conversation despite the distances. Given the extreme differences in technological training and experience levels that can exist among reps and users, and the resulting need for translations between technical jargon and everyday speech, it is no wonder that such calls often last a very long time and cause high levels of frustration for all involved. To make matters worse, most of the dialogue between support representatives and their callers is frankly unnecessary, representing a significant waste of time and unproductive cost. Why should the support rep have to rely on the customer to laboriously and often incorrectly describe what appears on the user’s screen step-by-step when a vastly more efficient method for getting the information is available? Of what benefit is an on-site or desk-side visit when the problem that prompted the call can be swiftly and directly resolved from the support rep’s console without the need for any travel? The effects of the unnecessary dialogue on the people involved are typically both powerful and long-lasting at both ends of the conversation. For the company, the frustration levels of the support team members inevitably lead to costly turnover. The constant need to recruit and train new reps further lowers the overall effectiveness of the department. For the customer, the support experience is unsatisfactory; not only is there a loss of confidence in the capabilities of the support rep and team, but also a reduced level of trust in the reliability of the application itself. Tales of poor support and of inability to communicate with the support center or help desk are commonly heard throughout the user communities, and do damage to the brands they mention. The rationale for investing in remote support technologies is very straightforward. The pressure of razor-thin product margins and closely scrutinized IT budgets constantly reinforce the awareness that every second counts in the effort to increase support effectiveness while lowering cost. Any reduction in the amount of time that a problem case stays open automatically furthers two vital goals: the customer’s return to full productivity, and the rep’s availability to respond to other problems. Further, the technical competence and emotional rapport displayed during the support interaction has a significant effect on continuing customer satisfaction and loyalty. Remote Support Technology (RST) is a software application that enables two computers to interact directly. 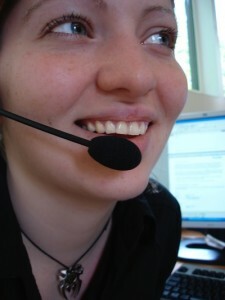 A support representative can act as if they were physically seated at the customer’s desk with their hands on the keyboard, looking at the monitor screen while the customer looks over their shoulder.From a different floor of the same building, across the street — even from a different city, state or country, the customer can give permission for a support rep to reach out over the distance and safely through the firewalls to see and work directly with the user’s computer as if they were standing beside the desk. What once took many frustrating minutes to describe is now crystal clear to both user and rep, enabling much faster diagnosis and resolution of difficulties. The result is sharply increased customer satisfaction and significantly lower costs for support, quickly recouping the initial investment and generating a significant ongoing return. The first step in using the RST application is to establish the connection, which requires that the customer initiate a request for support and to give explicit permission for the rep’s access. A temporary software module is then downloaded to the customer’s computer, which will be automatically and completely removed at the end of the session. Once the connection is open, the rep can see the customer’s computer screen, and can enter commands just as if they were seated at the customer’s desk. The customer supervises every step, and has the ability to terminate the access at any time. An audit log can be automatically kept to record all commands and actions from beginning to end. Every customer support or IT help desk team faces the same challenge. Some types of support calls inherently involve the necessity for checking several different aspects of the user’s software suite of applications and operating system files. For example, when there is a problem in printing a file — is the difficulty in the printer configuration at the operating system level, or is the mis-communication to be found in the word processing or other application program? The user typically will not know, and so the support rep, like an air traffic controller guiding a pilot flying on instruments through thick fog, must talk them through the various checks and changes that will be required. Rep: Open up your System Preferences, and click on Print & Fax. Caller: Where do I find the System Preferences? Rep: Look in the upper left corner of your screen; click on it — do you see it now? For many years, throughout the industry, this scenario has been all too common to virtually all support centers, both internal help desks and external customer support contact centers alike. When both caller and support rep were evenly matched in technical knowledge and spoke the same language with the same accents, there were still significant delays just from the necessity to talk through all of the steps and results of the diagnostic and resolution phases of the call. Add in accents and substantial differences in technical knowledge between the parties, and the time factor goes way up while the chances for successful resolution go down. The clock is ticking, and the costs keep growing. For more and more support reps, however, the addition of an on-demand remote support technology to the rep’s toolkit is making a dramatic difference. Now the rep can take direct control over the user’s computer over the Internet while the user watches. Instead of asking the user to open windows and click on options, the reps can do it themselves while explaining both what they are doing and why. The result is increased customer satisfaction, faster and more reliable resolutions, and significant reduction in support center operating costs. Remote Support Technologies, RST’s, have been available in one form or another for a number of years. Before the Internet, several different products allowed a rep to access a system remotely through dial-up phone lines. However, since few users or reps had multiple phone lines, the communication between the user and the rep was shut off while the operation was underway. The requirement for both user and rep to have a full copy of the same application on both systems was another barrier to adoption. 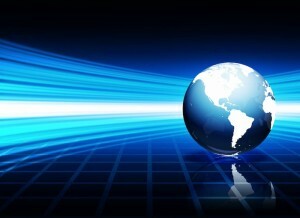 Corporate firewalls and restrictions on telephone modems tended to significantly restrict usage of the early products. Operating system incompatibilities were another huge issue; it was rare to find a product that had versions for more than one platform, so cross-platform remote support was often not available. The Internet, and the advent of the Software-as-a-Service (SaaS) or Cloud model have enabled the transformation of the RST sector. Now the necessary software for a remote session can be downloaded just-in-time, ensuring that the latest revision of the application is always being used. With a modern SaaS/Cloud-based RST, the common scenario described above looks very different. Gone is the need to laboriously talk the user through each step. Now, the support rep e-mails the user a link for immediate downloading of the session software to their local computer. The user then initiates the session, giving permission for the rep to access their computer over the Internet while the user supervises what is being done throughout the interaction. Once the session is open, the rep can explain what each step means as it is being done, and call the user’s attention to specific areas or results from use of diagnostic utilities. If additional files are needed, the rep can download and install them directly and securely through the application itself. Once the problem has been resolved, the session software is automatically removed, closing the access. What used to take many minutes and much confusion to accomplish can now be done in far less time, leaving greater levels of satisfaction at both ends of the line. For any support group, time is money. The longer the interactions take, the more staff is needed in order to respond. If call-backs have to be done, not only is more time being taken but the volume of calls is necessarily increased. 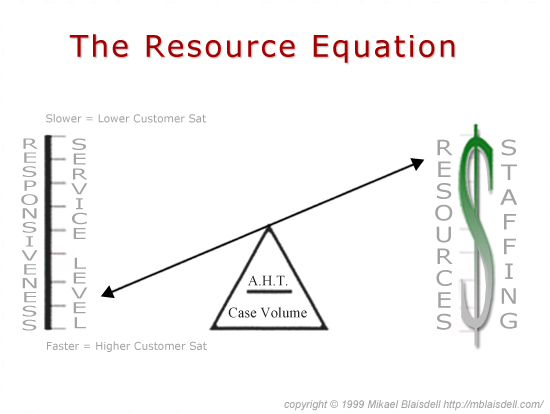 The Resource Equation shows how increasing the number or the time for the average call or customer interaction has an inevitable effect upon the numbers of trained staff members required to be ready to respond. As the see-saw diagram illustrates, pushing the bar down for a faster service level usually means investing in more staff members. However, the better way to increase the speed of response is to lower the volume of incoming calls/cases and/or to reduce the average handle time. For an IT help desk, simply enabling the rep to address issues without needing to take the extra time to physically go to the user’s desk brings a significant reduction to the needed staffing level. Here is where it can be seen how investing in an RST application can pay for itself. By reducing the average handle time, significantly cutting down the time for interactions by removing the need for the rep to talk the user through each step, the team frees up time in which to take more calls with the same number of reps. The financial case can easily be made to justify the expenditure. However, there are additional benefits which can improve the argument considerably. Beyond the immediate financial advantages of reduced operating costs for the support center and/or help desk, there are other significant benefits to be gained. The use of Remote Support Technologies gives support reps greater visibility into customer issues, and increases customer perceptions of the professionalism of the team and its value. By being able to actually demonstrate concepts and points to the customer on their own system, “just-in-time-training” may be given much more efficiently. Beyond the standard Break/Fix interactions, RST’s also enable delivery of a range of extended services to the customer than can be very profitable. Coupled with a remote diagnostic capability, or even by setting up unattended status checking from the customers own systems, the support center can be alerted to developing conditions and thereby intervene before problems actually occur. It is no secret that customer support is a challenging profession, or that the value that a well-equipped and trained customer contact center or IT support help desk can provide is substantial. But in order to deliver on the promised value proposition, the team needs to have the latest in enterprise-grade technologies and resources at their fingertips. Time is money at both ends of a support conversation, and when the time required can be reduced, the payback is immediately appreciated. By removing the need for extensive give and take of instructions and descriptions of results between the support rep and the caller, use of an RST means that diagnosis and resolution of problems is significantly improved. The reduction in the time required directly translates into lowered staffing levels and greater efficiency in the support team, and significantly improved overall profitability both operationally and in customer retention. For the customer, the result is greater satisfaction with the support experience, increased brand loyalty and beneficial word-of-mouth advertising. There are over a dozen vendors currently offering Remote Support Technology products. The HotLine Magazine has a recommended set of selection criteria, together with a Vendor List in a separate Research Paper: Selecting Remote Support Technology.